My cat, Pounce, has always liked dark, warm places. 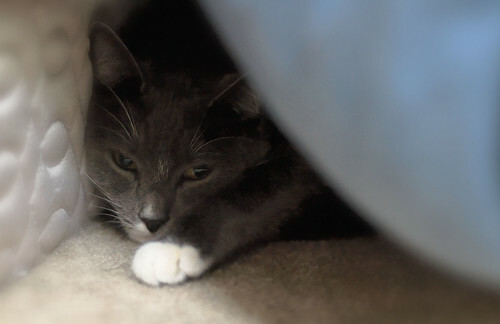 He used to hide under the bed, until I deemed that too dangerous and put the mattress on the floor. The morning sun peeking through the vaulted ceiling is too much for him and if there is the slightest flap in the comforter, he builds his burrow. Before work, I had Caitlin open it just enough for me to take this shot of him. It’s so rough being a cat. I had to retouch a little because my carpet is just that dirty. A small vigentte blur removed enphasis on the boxspring.